Thailand continues to be a popular choice among tourists and retirees from all over the world which is not surprising at all considering the country’s enticing natural wonders such as the internationally renowned beaches of Phuket and the beautiful and mountainous landscape of Chiang Mai. Retirees in particular may find the Kingdom to be the ideal place to unwind after years of hard work as its warm weather is perfect for relaxation. Furthermore, expenses in Thailand are very affordable that maximizing their retirement pay is hugely possible. These retirees simply have to secure their respective Retirement Visas and they will be all set to explore the Land of Smiles. What is a Non-Immigrant “O-A” Long Stay Visa? The Retirement Visa is a more popular term for Non-Immigrant “O-A” Long Stay Visa. 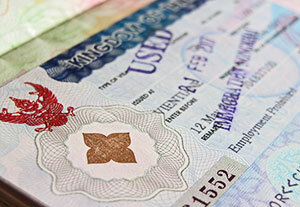 This visa allows the holder to continually stay in Thailand for a year and it is also renewable every year. The renewal may be done within Thailand although this is still subject to the applicable requirements. Age – the applicant of this visa must be aged 50 and above. 800,000 THB deposited at a Thai Bank Account for at least 2 months prior to the submission of application. Monthly income (sourced out from abroad) or pension of not less than 65,000 THB monthly. To prove this, the applicant must secure an affidavit from his embassy or consulate. A combination funds in a Thai Bank Account and annual income that would total at least 800,000 THB. Other documents – the police clearance and medical clearance are usually required if the application has been done outside of the Kingdom but there can be instances in which these would be asked from the applicant who filed for a Retirement Visa in Thailand. Where to apply for the said visa? The applicant can choose to either file his application in Thailand or in his home country. Application done in the applicant’s home country.The required documents must be submitted at the embassy or consulate of Thailand in the applicant’s home country. However, applicants should note that not all Thai embassies and consulates can issue the Non-Immigrant “O-A” Long Stay Visa. Application done in Thailand.If the applicant opts to make the application in Thailand then he must apply for a 90-Day Non-Immigrant Visa in his home country first. He will then have to travel to Thailand after granted with the said visa and wait for the 60th day of being in the country before he can file for the Non-Immigrant “O-A” Long Stay Visa (Retirement Visa). Apart from the documents stated previously, if the application is done in Thailand, the applicant must also provide proof of address in the Kingdom i.e. utility bills, rental contracts, etc. If you want to apply for a Thai retirement visa, please contact us using the button below. We will respond to your inquiry at the soonest available opportunity. I read this article and found it very interesting, thought it might be something for you. The article is called Thailand Retirement Visaand is located athttp://www.chiangmai-lawyer.com/thailand-retirement-visa.